This walk explores the hills around Spoleto: from Colle Attivole (or dei Cappuccini) in the south across Monteluco, Colle Ciciano and Colle San Tommaso to San Sabino in the north. It involves a lot of walking, so convenient exit and re-entry points are pointed out. The walk starts at Porta San Matteo: to get there from Piazza del Mercato, walk along the Via dell' Arco di Druso to the Arco di Monterone and fork right along Via Monterone. Fork right again along Via degli Abeti; continue along Via Egio; cross Viale Matteotti and continue along Via delle Monterozze; and then fork left at the end along Via Mameli to Porta San Matteo. Walk through the gate and across Viale Martiri della Resistanza, and continue under the portico of Via Madonna di Loreto (on the right in this photograph). This portico was built in the late 16th century to provide to cover the important processional route to the church of Santa Maria di Loreto (see below). The arms between the arches record the various noble families that contributed to the cost. The inscription on the left on the inner side of Porta San Matteo records that the papal governor, Cardinal Giambattista Rubini restored it in 1673. The portico subsequently fell into ruin and was restored in 1971. Continue to the church of Santa Maria di Loreto. After seeing the church, return along the portico and turn right just before the end along Via Valadier. There is a fresco (1762) of the Santa Maria Immacolata in an aedicule at the junction with Via San Paolo. The important church of San Paolo inter Vineas is just beyond on the right. The church contains important frescoes and is open for Mass on Sunday mornings. The ex-convent, further along Via San Paolo, on the right, now houses the Alberghiero di Giancarlo de Carolis, a catering college. Return to the junction with Via San Paolo and turn right along it. Turn right at the end along Viale Martiri della Resistanza and right again along Viale Matteotti. Continue along Viale dei Cappuccini and across Largo Ojetti (a roundabout). The tall cypress trees ahead betray the presence of the Convento dei Cappuccini. A path to the left (illustrated above) leads to three flights of steps through the woods that cut off the bends of the road up to the convent. Take a short detour to the right the second time that the steps meet the road to see the marble war memorial (1929) to those killed in the First World War. Turn left at the top of the last flight of steps to see the convent at the top of the hill. Retrace your steps along Viale dei Cappuccini and turn right along along Viale Matteotti to the junction with Via San Carlo (the old road to Rome). •The church of San Rocco is on the right. •The excellent Ristorante della Sacrestia (signed), which occupies what was the Oratorio di San Sebastiano, is across the car park on the right. The church of San Pietro (across the Tessino river and the busy main road) looks down on the old road to Rome from the lower slope of Monteluco. Take the path that runs along the left side of San Pietro and then behind its campanile and apse to San Silvestro (described on the same page as San Pietro), which is sometimes open for Mass and has an important fresco on its altar wall. It is possible to take a nice but quite steep detour here to San Giuliano as an alternative to a much shorter detour along a tarmac road described below. This is a fascinating church that was the focus for the religious lives of the hermits who occupied grottoes across Monteluco from the 6th century. In January 2008, the priest at San Pietro told me that the church is now always closed, and the owner of the adjacent Pizzeria confirmed that they no longer hold a key. You can however still see the amazing reliefs on the portal. To make this detour, turn right on leaving San Silvestro and turn left after a few meters up the path that is signed to San Giuliano. To rejoin the main walk, see the details of the shorter detour below. Turn left on leaving San Silvestro and then fork right along Via Giro del Ponte, which runs above the river Tessino to the Fortilizio dei Mulini (described below), above the Ponte delle Torri. You can break the walk by crossing Ponte delle Torri to return to the city centre. Turn right up the path known as the Corta di Monteluco (signed Sentiero 1) to the point at which it crosses the main road. “Corta” means short cut, and this was in fact a mule track to the top of Monteluco that was in regular use until the 19th century. This is the route that Bishop Giovanni Maria Mastai Ferretti, the future Pope Pius IX, took in 1831 when found it expedient to flee from Spoleto as revolution approached and seek help from the friars at San Francesco di Monteluco (see below). There are a number of monuments to see on the route here, but they are described during the descent (see below) because this ascent is missed by those taking the detour above to San Giuliano. The path is well signed, not least because it forms part of the newly-designated Via Francigena di San Francesco, a walking route from Assisi to Rome. This means that blue and yellow signs and lurid yellow way marks supplement the usual red and white way marks. The path reaches the main road after about 40 minutes. Turn right along the road and then turn left (after about 15 minutes) into the car park of the Pizzeria next to San Giuliano. To rejoin the main walk, retrace your steps to the point (signed) at which the Corta di Monteluco crosses the road and turn right along it. Cross the road and continue along the signed Corta di Monteluco. The final ascent to the top of Monteluco takes about 20 minutes. The path curves around the tiny church of Santa Caterina to San Francesco di Monteluco. From the early 13th century, Santa Caterina served as the focus for the religious lives of the Franciscan friars who settled here and built the old convent. A number of hermitages associated with these centres sprang up across the mountain, creating a Franciscan complex similar in character to the much older one centred on San Giuliano. Santa Caterina and the old convent are now inside the convent walls: this plan (adapted from one in San Francesco) provides a schematic of the convent before these walls were built. 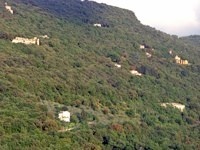 On leaving San Francesco turn right into the clearing that has a replica of one of the cippi of the Lex Spoletina (ca. 240 BC). The two originals, which were found between Spoleto and Trevi in 1879 and 1913 respectively, are now in the Museo Archeologico: they contain inscriptions forbid the desecration of the sacred woods. The copy has been placed here because he name of the mountain derives from the Latin “lucus” (sacred grove). Describe the route to the grotto of Blessed Francis Beccaria of Pavia]. [Describe the route to the grotto of St Antony of Padua]. Retrace your steps along the Corta di Monteluco and continue across the road. The path continues to the facade of the church that is now within the hotel on the site of the Eremo di Santa Maria delle Grazie. This church and associated hermitage became the focus for the religious lives of the remaining hermits on Monteluco when San Giuliano (see above) was closed in 1502. Continue down past a villa signed “Istituto di Vigilanza di Spoleto” [More] and then past the private road that leads to the hotel. This brings you down to the private chapel (1850) of Francesco Marignoli. The inscription records that he erected it in honour of St Francis on the site of a hermitage that had been dedicated to St Paul the Hermit. He is buried in front of the chapel, under the Franciscan sign “tau” laid out in bricks on the grass. the Convento di Sant’ Antonio Abate. Start to look for it as soon as you glimpse the Rocca ahead: the aedicule on the left, which is at the start of the path, is only visible after you turn along it. The path then runs along the cloiste of the ruined ex-convent and round to the facade of its church. Return to the Corta di Monteluco and continue down it to the Fortilizio dei Molini. Matteo di Giovannello, il Gattapone restored this fortified tower as part of the new defensive arrangements for Spoleto associated with the construction of the Rocca. Water from the aqueduct was stored in a cistern here and used to drive a mill that the papal authorities made available to local farmers (at a price). The tower is in restoration (at January 2009). Turn right along the Giro dei Condotti (Sentiero 3), which ha an exit point after 20 minutes and takes just over an hour in full. It is so-called because it runs along the line of the aqueduct that still brings water to Ponte delle Torri and the fountains of Spoleto. Stop at the first picnic table to admire the lovely view of the Rocca and Ponte delle Torre. You can also see the medieval walls of the aqueduct below. You can also look down on the ruined the Eremo di San Leonardo (13th century). According to the Statutes of 1347, this marked the northern boundary of the hermitage of Monteluco, from which women were excluded. A path further on, on the left, leads down to the Eremo di San Leonardo and an adjacent grotto. [I have not had time to go down there yet]. The lady in the picture is Daniella Cittadoni, who was my superb guide to Monteluco. A number of women did live in small eremitical communities beyond this point, probably from a very early date. At around the end of the 13th century, they were mostly forced to adopt one of the recognised religious rules. All trace of the resulting nunneries have since disappeared, with the exception of the ruined Eremo di Sant’ Elisabetta (see nunneries on Monteluco). You can see it from the Giro dei Condotti and a signed path on the left leads down to it. There is really little to see at Sant’ Elisabetta. turn left along the Via del Tiro a Segno, which leads to the Ponte Ponzianina. Fork left at the T-junction to follow the signed Sentiero 8 (temporarily leaving Sentiero 3, which carries on uphill) and cross the signed Ponte Sanguinetto. You soon come to a fountain on the right. The terracotta tile in the niche has a handwritten love poem on it. Continue to a wide sandy clearing. The ex- nunnery of Santa Maria inter Angelos here is in restoration (at January 2009). It is to be opened as a hotel at some point. Follow the signed path (now Sentiero 3 again) to the left around Santa Maria inter Angelos, back towards Spoleto. The path is flat at first and then runs steeply downhill, with fine views of the Rocca and the Duomo on the left and San Ponziano (see below) on the right. The path runs then down to the busy main road and curves along it of the left to Via Tiro a Segno, where the Giro dei Condotti ends. Walk along Via Tiro a Segno, under the main road, towards the city walls. There is a good view here of the new (at 2010) Scala Mobile up to the Rocca. You can break the walk by crossing Ponte Ponzianina to return to the city centre. Turn right along Via delle Lettere and then right through the underpass. A turning on the right leads to San Ponziano. Return to the lane and follow it up passed the cemetery to the church of San Salvatore on the left. Having visited the church, turn left up the lane and continue as it becomes a narrow path. The path joins another lane (at the junction illustrated here). The tiny ex-church of San Michele Archangelo is hidden in the trees opposite this junction. Retrace your steps past San Salvatore and San Ponziano and continue along the lane, under the main road to Via delle Lettere. Turn right along it to Villa Redenta. If you want to return to the city at this point, turn right on leaving the villa and walk along Via Flaminia Vecchia to Porta Garibaldi. Turn left on leaving the villa, left again along Via Villa Redenta, and right at the end along Via San Tommaso. Take the left fork, which passes over the railway line, and then take the first turn on the right. 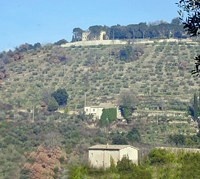 The house that was once the church of the nuns of San Tommaso is on the right. Continue ahead: the flat area below on the left is Piazza d’ Armi. The Museo Archeologico contains grave goods (7th century BC) that were found here in 1982 and 1989, as well as similar finds from five tombs that were excavated here in 2004-5. Excavations in 2008-9 near the “rotonda” ound traces of an Umbrian temple (5th century BC). Continue ahead until you see some green iron gates on the left, and turn left along the path that leads down to the main road. 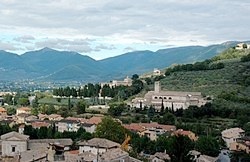 The interesting church of San Sabino is included in the page on drives from Spoleto. You can alternatively take a detour from here of about 45 minutes along tarmac roads. If you want to see inside the church, check ahead to ensure that it is open. To make the detour, turn right along the main road and then fork right at the cemetery. The next road on the left leads to San Sabino (signed). Then retrace your steps to the junction and turn right along Via Visso. Cross the road and continue along Via Visso. Turn left at the end along Via Marconi. Take a short detour by turning left along Via Tito Sinibaldi, a small road just before the railway line. Casa Sinibaldi, at number 23, stands on the site of the ancient church of SS Apostoli. Return to Via Marconi [and fork left to the railway station]. The modern sculpture is "Teodelapio" by Alexander Calder, which is named for Duke Theudelapius of Spoleto (602-52). It was installed here in 1962, as part of a programme that saw 104 such works installed across the city. You can catch the bus here back to the centre of Spoleto. If you still have any energy left, walk along Viale Trente e Trieste. A second modern sculpture from the 1962 project was installed at the other end of this road: this is the “Colonna del Viaggiatore” (traveller’s column) by Arnaldo Pomodoro. Continue across Piazza della Vittoria to Porta Garibaldi, where the walk ends.